Boating is king here in southwest Florida. Take to the water of the Gulf of Mexico, explore the 10,000 Islands, the Florida Everglades and Crayton Bay. Naples FL Boat Tour, sunset cruise tours, Eco-Tours and sight-seeing boat tours are very popular View Florida wildlife like; manatee, dolphin, eagles, alligators and more. We found the best Boat Tour Operators in Naples. To feature your business, contact us. Comprehensive marina services, including boathouse dry storage slips, membership in the Wet Slip Association, and private clubhouse and pool for members. 880 – 12th Ave. S.
The dock can accommodate lengths up to 110 feet on the T heads at the end of each set of slips, as can the fuel dock. Slips are usually available for transients, although reservations are recommended. 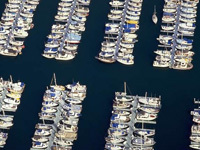 With six inside and six outside service bays, this marina provides efficient service to your boat. Offering a daily public cruise, weddings, corporate functions and private parties aboard elegant yachts.